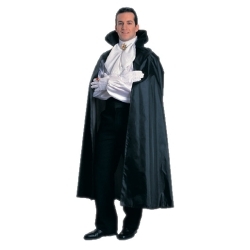 The cape is a classic costume accessory and can be used for any number of Halloween costumes such as witches, vampires, and magicians. This cape is made of taffeta and has a 4.5” foam stand-up collar. The full length taffeta cape is available in black and measures 56” in length.